This article will show you how to import the listings from your Newegg account into Solid Commerce so you can manage them through our platform. Before you import your listings, you need to connect to Newegg (see Connecting to the Newegg Marketplace) and create a Newegg Market List (see Creating a Market List). Before you can import your listings into Solid Commerce, you need to export them from Newegg. 1) Log into your Newegg Seller Portal. 2) In the sidebar menu, click on Manage Items. Click on Item List from the submenu that appears. 3) Click the Search button on the upper right-hand site to find all of your items. 4) Click the Export All button at the lower left-hand side. 5) Give the export file a name and select a location on your hard drive to save it. 6) Open the exported file in Excel. If the SKUs you're importing from Newegg already exist in your Solid Commerce account, you can skip to the Importing Your Listings From Newegg section below. You can also use the Products & Inventory tab of the template attached this article. If you need to customize our template, see Creating and Customizing a Solid Commerce Excel Template. 2) Copy the Seller Part #s from your Newegg export. 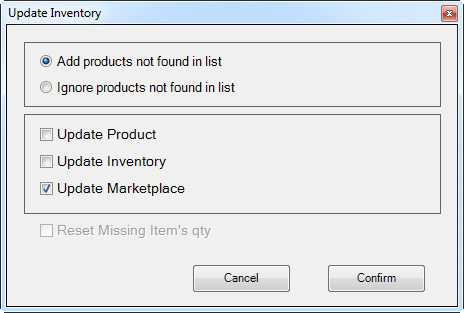 Paste them in the product custom sku and warehouse id columns in your Solid Commerce file. 3) If you provided MSRPs to Newegg, you can copy them from your Newegg export. Paste the MSRPs in the msrp column of your Solid Commerce file. This is an optional field in Solid Commerce. If you have not provided your MSRPs to Newegg, you do not have to populate this field. 4) Copy the Inventory from your Newegg export. Paste the quantities in the qty column of your Solid Commerce file. 5) product name is a required field. The product name can be edited later. Some people simply paste their SKUs in it. 6) Enter the name of your Solid Commerce Warehouse in the warehouse name column. 7) Populate any of the optional fields you would like to add to Solid Commerce, such as the upc, image file, or custom product attributes. 8) Upload your file with a Product and Inventory update. 1) Download the Newegg.com Importing Listing Template.xlsx file attached to this article and open it in Excel. 2) Copy the data from your Newegg export file and paste it into the Newegg Importing Listings tab of the Solid Commerce template. newegg qty exp Enter lq in this field if you want to make your entire inventory available on Newegg. You can also enter formulas. See Using the Listing Quantity Expression to Control the Quantities on Your Listings. list name Enter the name of your Newegg Market List in Solid Commerce. market auto rule We created a default rule to make things easy. Always enter: Newegg Default. Enter No to import your listings with the automation turned off. Enter Yes to import with the automation turned on. Solid Commerce will automatically sync with your listings when the automation is on. If you are new to Solid Commerce, we recommend importing your listings with the automation set to No until you are comfortable managing your inventory, prices, and listings through Solid Commerce. With the automation turned off, we will not communicate with your Newegg listings. For more information about using the automation setting, see An Explanation of the Automation Setting and Marketplace Listing Updates. 5) Upload your file with a Marketplace update. Newegg Importing Listing Template.xlsx — Paste the data from your Newegg export file into this blank template. Newegg Importing Listing Example.xlsx — The template populated with an example product.